It is with great sadness that one of the best known characters of the Squadron's Canal Zone Days passed away on 30 June 2015. Tom joined the Corps as a boy entrant at Gibraltar Barracks Aldershot (as a trumpeter) and trained as a blacksmith at the REME Base Workshops in Aldershot. 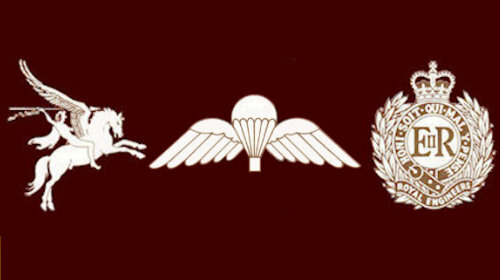 In 1948, at Bindon Barracks Hameln, BAOR, he was one of forty-two ex-boy soldiers on the formation parade when 9 Airborne Squadron RE changed its title to 9 Independent Parachute Squadron RE in the newly formed 16 Independent Parachute Brigade. On the Squadrons return to Aldershot from BAOR in 1949 Tom was a member of 2 Troop and remained in that troop until in 1951. The Squadron were posted to Moascar in the Canal Zone where he was promoted to sergeant. In 1953 he moved to 3 Troop as the Recce Sgt to team up with his great friend Eric Blenkinsop, and Lt Donald Spiers. Tom was a small arms instructor and was put in charge of training the very successful Squadron shooting team. He also played rugby for one of the teams during an outstanding period of success on the sports field for the Squadron. In 1953 he was posted to the Engineer Regiment of Arab Legion of the Jordanian Army for three months as a temporary Field Engineer instructor. Returning from the Canal Zone to Waterloo Barracks Aldershot in 1954 Tom married "Bobby" his only girlfriend, and they remained together until Bobby sadly passed away in 2002. Before they were married Tom confided in Lt Spears that he had met a very intelligent girl. Asked how he knew she was intelligent he replied "because she thinks I am wonderful". He continued as Recce Sgt in 3 Troop until 1955. Tom had suffered a back injury and could no longer remain in 9 Parachute Squadron. He was posted to the Army Air Transport Training and Development Unit at RAF Old Sarum Wiltshire. 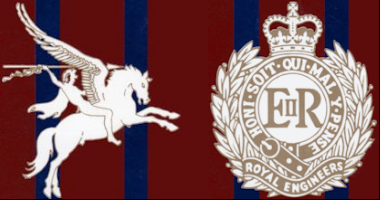 Because of his reoccurring back problem Tom was downgraded and left the airborne fraternity and was posted to the Junior Leaders Regiment based at Old Park Barracks, Dover. In 1963 Tom, with his wife Bobby, two sons, Robert and Michael and daughter Meryl arrived at Terendak Camp situated on the west coast of Malaya near Malacca. He was to take up his post as Squadron Sergeant Major of 11 Independent Field Squadron RE. Being the SSM was not an easy appointment as the squadron was part of 28'h Commonwealth Brigade and it was a mixture of British, Australian and New Zealand soldiers. Australian sappers formed an additional troop (4 Tp) and were an integral part of the unit. An uneasy relationship with the recently departed troop back to Australia had existed but Tom with tact and not a little diplomacy immediately had a man to man talk with Craig (Bing) Crosby the Australian troop Staff Sergeant. They hit it off immediately and the relationship between Brits and Aussies greatly improved over the next three years. Tom and Craig became great friends and they maintained a contact for over forty-five years and on two occasions staying with Craig at his home in Tasmania. During his period as SSM of the Squadron Tom was responsible for setting up accommodation camps in Ubon, Thailand, close to the Cambodian border in readiness for the start of the construction of an airfield capable of taking the largest aircraft in the RAF. On completion of his tour as SSM in 1966 Tom had a varied career serving in Paderborn, Nienburg and Osnabruck in BAOR. He had been promoted WO1 in 1968 and commissioned in 1970. His final posting was as the Personnel Selection Officer at the Army Apprentice Collage Harrogate. He retired from the Army in 1978. After the formation of the AEA, Tom became a leading light in the Yorkshire Branch and helped in setting up the association museum in RAF Elvington near York. He attended many of the reunions held in various locations around the country, but sadly when his beloved wife Bobby past away in 2002 a light went out of his life. His friendship with Eric Blenkinsop and Lt Donald Spears was to last for the remainder of his life and in 2008 he travelled down from his home in Yorkshire to Camberley to attend the Golden Wedding celebration of the now Sir Donald and the late Lady Sylvia Spears. He was diagnosed with Alzheimer's disease in 2012 and cancer in 2015. Many words were used to sum up Tom Thornton during the eulogy read at his funeral: humorous, calm, determined, loving, strong and courageous are but a few, but his family and friends will identify with them all in their memories of the wonderful person he was. Our condolences to sons: Robert, Michael, daughter Meryl and Tom's extended family.